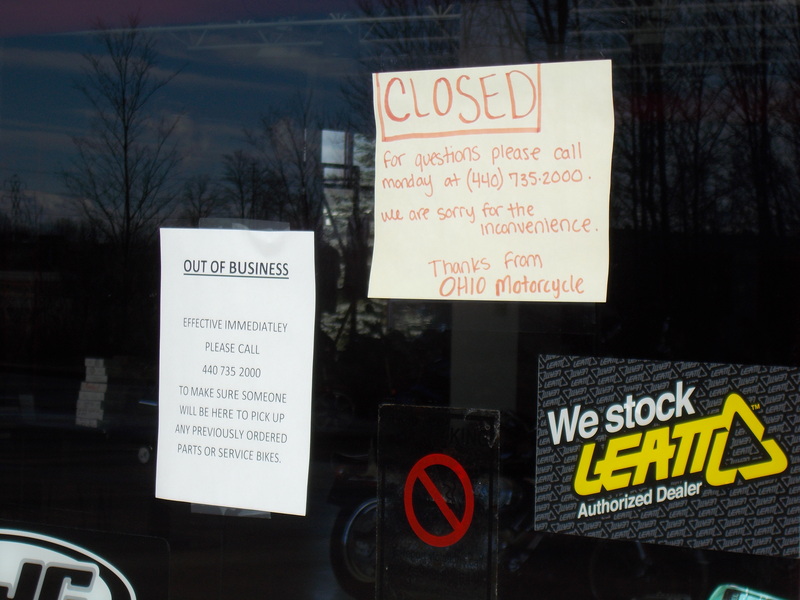 Found out last month that Ohio Motorcycle, a Honda/Yamaha/Triumph/KTM dealer off I-271 near Cleveland, has closed. It’s not far from my parents’ house, so we’d stop there every now and again during visits home. They had a nice selection of bikes and gear and it was reassuring to know there was a Yamaha outlet nearby if Terra Nova developed a problem while we were out that way. I’ve developed a habit of learning the location of motorcycle shops when we travel. It started with Endurance, and my discovery that BMW maintains a slim number of dealers around the country. So I’d do my research and start knitting my safety net. In a similar vein, I mapped out distances between gas stations on U.S. 395 between Reno, Nevada, and San Diego the first time I took Discovery on a ride to see my Uncle Robert. The bike has a four-gallon gas tank and I wanted to know where my refueling points were. I don’t know the financial specifics of OM, but I’m aware that motorcycle businesses are difficult to maintain. There’s the seasonal aspect of riding; buyers come out mostly in nice weather. And some owners see bikes as expensive playthings that can be sold if economic times get tough. But all motorcycle riders appreciate bike shops. They’re places of commerce, spare parts, and other necessities – and dreams. So I’m disappointed to see Ohio Motorcycle close. It’s one less light on the dark road home.